Grail pieces. Rolex Submariner. A Lange & Söhone Datograph. Omega Speedmaster. Panerai Luminor. The actual grail piece will differ from one collector to another. But we all have one. And my readers will know that mine was a Panerai Luminor. Just look at my top ten fantasy list and you will see two Luminor plus one Radiomir. And now, my collection contains a sensational limited edition Luminor. And this is the the story. A grail piece is that one dream piece that you fantasize about. It’s the piece that you say, “the day I acquire this piece is the day I stop collecting.” It’s the ultimate prize. It’s the embodiment of superficial material desire. It’s…magnificent! And my personal grail had long been a Panerai Luminor. 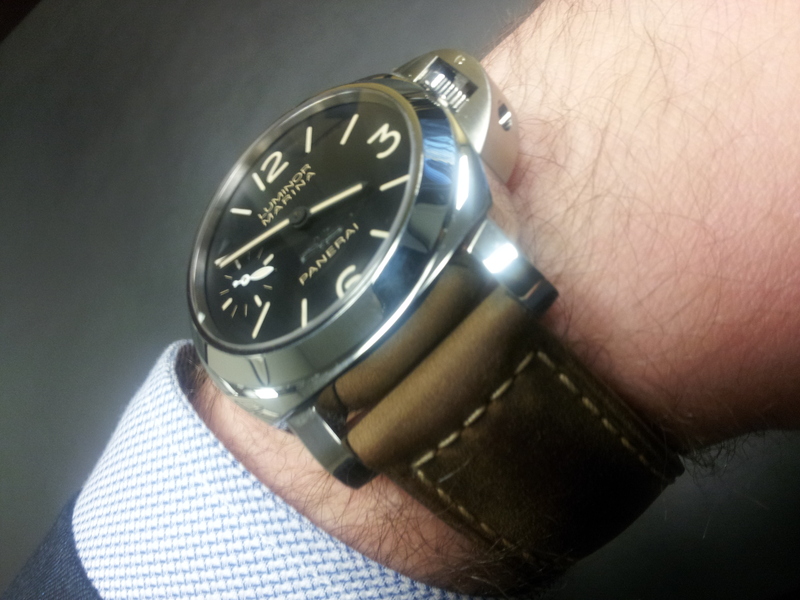 See my previous blogs for my fascination with Panerai and also for some comments on my first Panerai Radiomir. OK, so now that you’ve read all about my admiration for Panerai, we can continue. Over the years, I had given in to temptation many times and acquired different timepieces. They were all fine pieces and they made up a beautiful collection, but everyone told me to stop. Wait. Save. Buy fewer pieces and save for a “better” piece. The man who helped with my first Panerai acquisition, and who also supplied me with the Luminor, one said of these other pieces, “they’re just band-aids. They stop the itch, but they don’t cure the urge to own a Panerai.” Now I have blogged about many great watches under $2,000 and I certainly admire many less expensive watches, but while I was collecting various watches, I dreamed of a serious Panerai Luminor. As my watch guy said, the Luminor is just an amazing presence on the wrist and also, for me, a stylish statement. While I have blogged that Panerai are known for using ETA movements, Panerai modify these movements heavily to meet their own demanding requirements. So I really consider Panerai to be the real macoy. OK so here I am, with quite a nice timepiece collection, still wanting a Luminor, and not even wearing some pieces each week because I have too many. Then I remember my watch guy telling me to gradually unload the watches I don’t wear, even if I take a loss, and apply the cash toward a Luminor. It sounded like a lot of work. But it made sense. And then an opportunity came. I found a limited edition Luminor at a price that could work. I had sold some pieces to a friend earlier this year and then I was able to unload my older Panerai and two other pieces in one shot. And this allowed me to acquire my ideal Luminor. I won’t blog much about the specifics of the piece because it’s not too relevant. But going home with this piece… awesome. Exciting. Now, on the day of the purchase, I was alone with my daughter. It was daddy daughter day. And we had the most amazing day together. It just magic spending the day with her and bonding- she’s 18 months old. We played, napped, rode out in the car together, and visited the watch dealer. This was a touching aspect of my day. Acquiring your dream material possession is fun, but it doesn’t compare to the sound of a little girl’s laughter. Or watching your little girl fall asleep on your shoulder. But acquiring your “grail” piece while enjoying a memorable day with your daughter certainly does add a very personal and emotional feeling to the whole experience. So, my friends, while I encourage you to enjoy whichever timepiece fits your budget, my friends were right. Patience can be rewarding. And even tough I enjoy having some variety in my collection, I think one “big” piece is better than three “smaller” pieces. In my case, the quest for the grail was a long and expensive process. But it was lots of fun and I learned during every step. I made friends, contacts and enjoyed the game. But it feels good to wear MY grail piece after all this crazy journey. Who knows if there will ever be another grail piece for me. Perhaps. I’m more looking forward to my next daddy – daughter day, though.